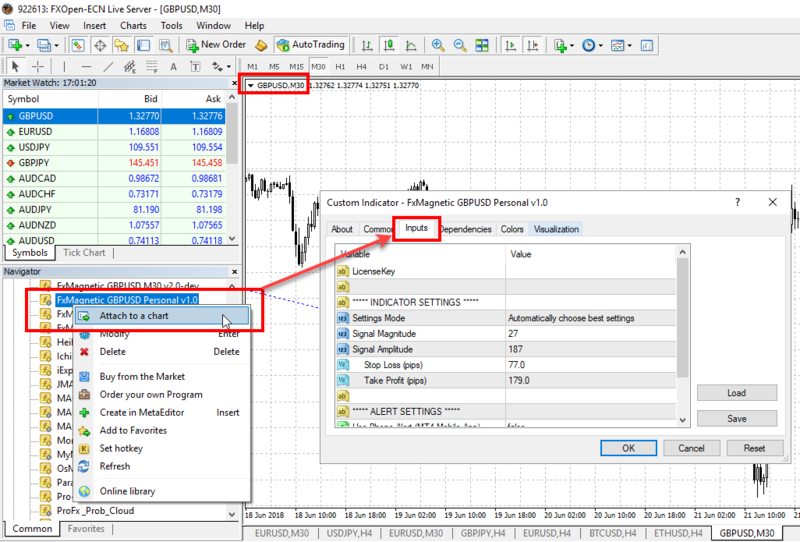 In this short tutorial, I will explain how to change the settings of FxMagnetic custom indicator on MetaTrader 4. FxMagnetic does not have lots of parameters which makes it very easy to use. 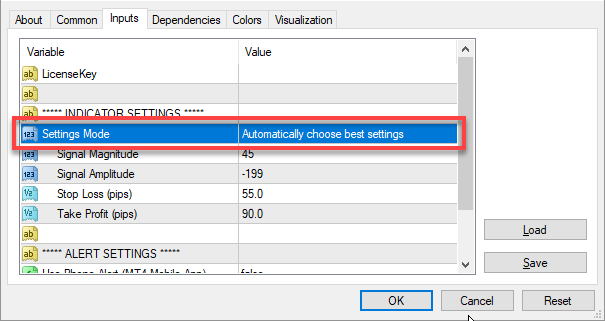 Most of the parameters are set automatically for best performance. When you install and attach the FxMagnetic on the chart, you will see a Properties window. When you switch to the Inputs tab of that window you’ll see FxMagnetic settings. If you already have an MT4 indicator on the chart and want to change its settings, then you need to open its Properties window again. To do that, right-click on the chart (CTRL+I), choose “Indicator List”, choose the indicator and click on “Edit”. See the image below for example. The one parameter that every user must add is the License Key. Every trader using the FxMagnetic have his own License Key and it must be added into the very first parameter field. You need to do this only one for successful authorization. Later on, you can start FxMagnetic of the same currency pair without the License Key – indicator will remember the License Key from earlier sessions. FxMagnetic Trial version does not need a License Key, but full version requires it and all users get the Key after the purchase. First, let me introduce you to the new parameter which was essential for this MTF change to happen. When “Settings Mode” are set to “Automatically choose best settings” the FxMagnetic indicator will ignore any values you put into the “INDICATOR SETTINGS” section. This means FxMagnetic will choose best settings for Signal Magnitude, Signal Amplitude, Stop-Loss, and Take Profit. 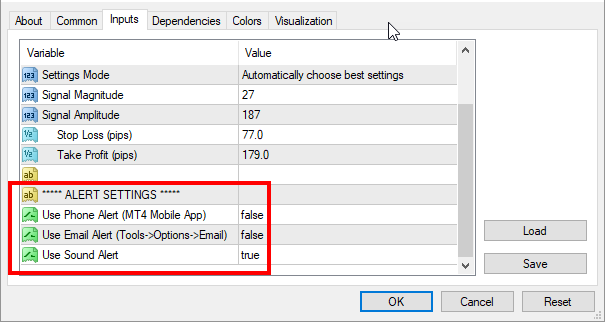 Parameter values are different for each timeframe but you do not need to worry about that because indicator will select them automatically. If you want to know what parameter values indicator is using you can find them in the EXPERTS tab of your MT4 terminal after FxMagnetic is loaded on the chart. 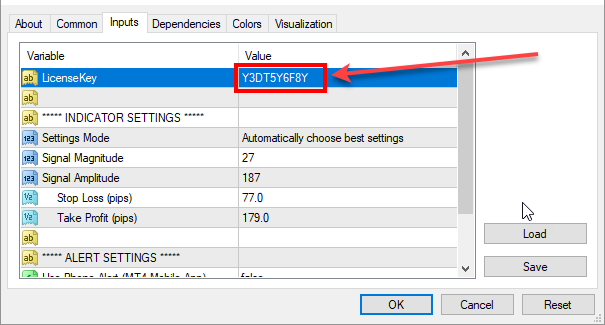 When “Settings Mode” are set to “I will set settings below myself” the FxMagnetic indicator will use the values set in the “INDICATOR SETTINGS” section. In this example, the settings would be like we see in the picture above. FxMagnetic can send trading signal notifications by email or directly to your MT4 Mobile App. By default, only sound alerts are enabled. 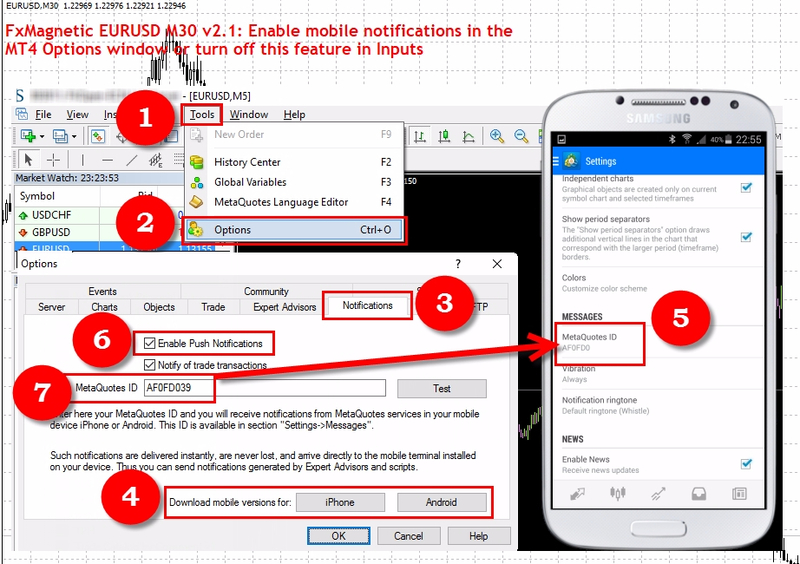 Before you enable Email or Phone alerts you have to complete some configuration. To receive Phone alerts from MT4 you need to install MT4 Mobile app. You can download it from Google Play market for Android or iTunes for iPhone. Download buttons for these apps can also be found in the MT4 Options window. We’ll get there soon. Refer to the image below and follow the steps. Go to Tools->Options from the top MT4 menu. Then, open the Notifications tab. There you’ll find buttons to download mobile versions of MT4 for iPhone and Android. When you install the MT4 Mobile app on your Smartphone you’ll have to locate your MetaQuotes ID in the Settings section of the MT4 Mobile app. Then, in the MT4 Options window, check the “Enable Push Notifications” and enter your MetaQuotes ID in the corresponding field. Click “Test” to see if notifications come through. If all works fine and there’s a connection on your computer and Smartphone you should get the notification in a few seconds. It is very rare for these notifications to arrive late, but it happens sometimes because of Internet connection problems or problems alike. But when all is fine these alerts arrive in a second or so. 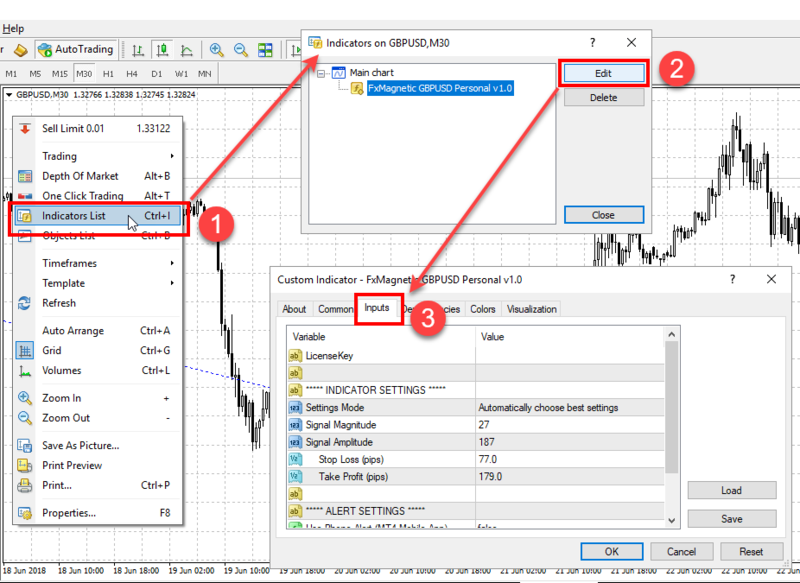 When you have enabled notifications in the MT4 Options window, you’ll need to enable them in the FxMagnetic settings too. Go back to FxMagnetic settings and set TRUE for the “Use Phone Alerts” field. It is a bit trickier with email alerts. 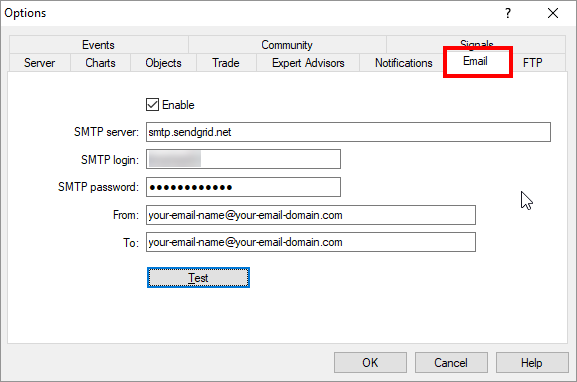 MT4 allows sending emails only from your own SMTP mail server which means you need to have one. There are many ways to configure these settings and it all depends on your Email provider. But I’ve found that using Sendgrid is the easiest way. And it’s free. They allow sending 100 emails a day for free. When you create your Sendgrid account (which takes about a minute) you’ll have a username and a password. When you have Sendgrid account you can open Email configuration window in MetaTrader and input your Sendgrid parameters. To configure your email settings, open the Tools->Options->Email window. 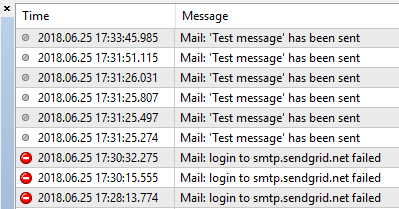 Click “Test” button to send a test email and check your inbox if you’ve received it. If MT4 was able to send the email through Sendgrid you’ll see a success message in the JOURNAL tab. Otherwise, you’ll see an error message. Now you see that FxMagnetic is really easy to configure. It does not have hundreds of parameters and there’s nothing to guess. Most of its settings are controlled automatically, but if you want, you can always change them the way you like. Which part of FxMagnetic configuration is the most confusing? Let us know in the comments below so we can improve.